Some called the neighborhood Virginia City back in the 1920s. To others it was Cherry Heights. Ultimately, North Long Beach would edge out the competing names. From 1925 on there was a Catholic church, actually a mission, on Cherry Heights. 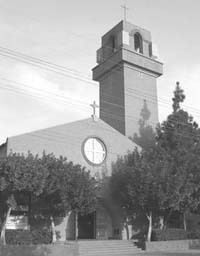 Holy Innocents Church at 425 E. 20th St. sponsored this outreach facility – known initially as the Parish of North Long Beach – and supplied it with priests in those pioneering years. Work on a permanent church home was begun on Dec. 28, 1925, at the intersection of Market Street and Linden Avenue. Construction moved rapidly, and the first Mass was celebrated there on Feb 7, 1926, by Fr. Maurice J. Ryan of Holy Innocents. North Long Beach Mission was transformed into St. Athanasius Catholic Church in late 1933. Fr. Thomas O’Sullivan would arrive in 1934 to become the first of only three rectors who would server the church over the next 50 years. In 1944, Fr. Joseph Feehan arrived just prior to the great post-war boom. School facilities and a convent were built in the late 1940s, with a new church erected int he early 1950s. It supplemented rather than replaced the original structure, still in use for educational purposes. Fr. Feehan remained through his 50th anniversary in the priesthood, in 1977. Incumbent Fr. John Gutting, the third rector, arrived in 1977. St. Athanasius celebrated its 50th brithday on Oct 23, 1983 with nearly 2000 family participation.